adjustment of status > Non-LPR Cancellation of Removal victory in NYC immigration court! Today, I received a decision of an immigration judge granting my clients (husband and wife) cancellation of removal for non-permanent residents and giving them lawful permanent resident status! This was a long journey for my clients. They previously went to a lawyer, who did not inform them that they were both ineligible for adjustment of status under INA section 245(a) or 245(i). The female client’s US citizen mother had petitioned for her, and the petition was approved, but the lawyer never informed my client and her husband (the derivative beneficiary), that in order for them to adjust their status under a preference category (since the petition was for a married daughter over the age of 21), they had to be either in lawful status (which they were not since they overstayed their tourist visas), or be eligible under INA section 245(i) by showing someone had previously petitioned for them prior to April 30, 2001 (which they couldn’t show since it never happened). Their adjustment of status applications were denied. That’s when they consulted with me (in 2013). 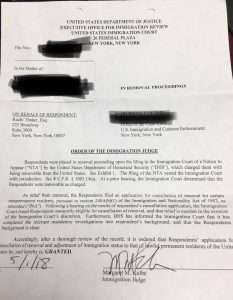 I told them that they would be eligible for non-permanent resident cancellation of removal under INA section 240A(b), but ONLY if they were in front of an immigration judge, since this form or relief can only be sought in immigration court, and there is no way to affirmatively apply for it (like many other forms of relief). I told them only Department of Homeland Security had the discretion to start (or not start) a removal case against them, and unless and until the removal case started, I could not assist them in filing a cancellation of removal application in court. But, I helped the clients by ASKING the DHS to place my clients in removal proceedings. This was risky, and I explained it to my clients. While they may be eligible for relief and while WE believe they may have a strong case, there is no way to tell whether a JUDGE, who would decide the case, would feel that the clients had a strong case. This is especially true in cases like non-permanent resident cancellation of removal cases, which require a showing of “exceptional and unusual hardship” to a US citizen or green card holder qualifying relative. My clients have a teenage daughter who has autism. So while I thought they had a very good and strong case, there was no way to know whether a judge would feel that way. After I advised them that it may be a bad idea being placed in removal proceedings and losing the case (and having a removal order that can lead to deportation), they chose to try their luck in proceedings, since there was no other way for them to try to legalize their status in the United States. After almost a YEAR of effort trying to convince DHS to place my clients in removal proceedings, they were both finally issued Notices to Appear and placed in removal proceedings. We filed their cancellation of removal application, obtained work permits, and then once a trial date was scheduled, worked hard to put together strong evidence of their daughter’s struggles (as well as the female applicant’s US citizen mother’s struggles, since she was also a qualifying relative), medical and education records, what life would be like for her in a foreign country and presented all evidence to the judge and the DHS lawyer. After a hearing in January of 2017, judge decided that my clients were worthy of having their cases approved. DHS lawyer agreed. However, immigration law only allows certain numbers of visas to be available each year for non-permanent resident cancellation of removal applicants! There is a long wait and judges throughout the country have to request the visas they want for the cases they want to approve. So the judge requested the visas for my clients and told us we would get a decision when the visas numbers were available for my clients. For a year and a half! Finally, this week, I received the formal grant of cancellation of removal order for my clients! I am so happy for these deserving individuals, who will now get to stay in the United States and provide proper care for their daughter without worrying about whether they will be deported. The part I feel bad about is the lawyer they had previously, who took money from them to file a case that should never have been filed in the first place (and the lawyer should have known the criteria to adjust as a preference category beneficiary as opposed to an immediate relative category)! But I am glad my clients found me and that I was able to help them! Looking forward to them becoming US citizens in several years! Posted in adjustment of status, Green card, immigration, Immigration Court.